Once a major source of irritation for the country's Communist regime, John Lennon Wall remains an important symbol of Prague's struggle for democracy. Young Czechs started writing their grievances here in the early 1980s, often clashing with security police on a nearby bridge. 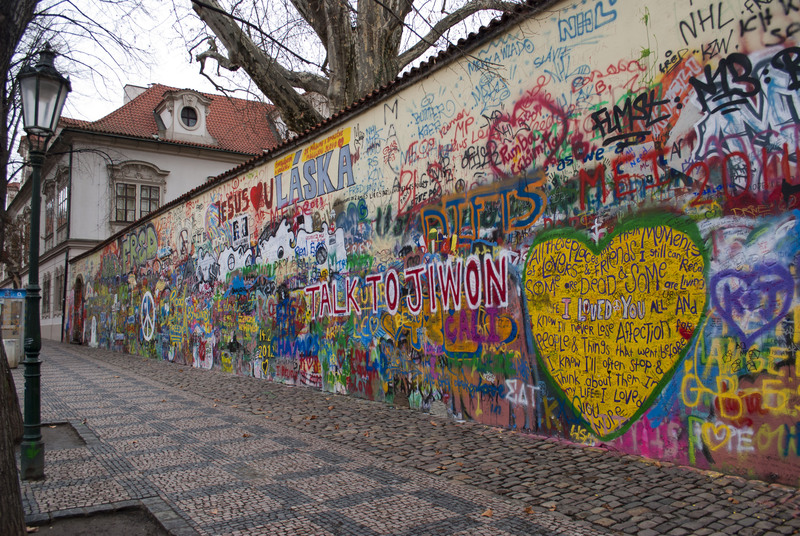 The wall lost its political edge in the 1990s and today features mostly John Lennon-inspired graffiti and fragments of well-known Beatles songs. The wall is a continuous work in progress, each new attempt to whitewash it simply providing tourists with a blank canvas on which to add more peace messages, drawings, and poems. For travelers who use our custom trip planner, Prague holidays become easier to arrange, with trips to the John Lennon Wall and other attractions mapped out and timetabled. Although it took us a little reaching the end we find it. A wall with graffiti and curious text color and font size. Many people reached by the photo of rigor and therefore a site is made to visit Prague. It is a symbolic wall. During the Communist era it was repainted several times. Now you have graffiti on graffiti but anyway it is a visit that is worthwhile in the city. If you are a fan of the Beatles it is absolutely not to be missed. A very interesting structure near the Charles Bridge which is a must go for everyone who's here - especially if you're a Beatles and John Lennon fan. It's pretty amazing how few people grow beyond their field into something so much more - and read the wiki background while you are standing near it. It's very interesting. The visit will only take a minute - and please don't expect much as it's just a wall. Few of the images are for adults only - so take kids with proper guidance. Not super connected with the man himself. However there is a great vibe with plenty of people taking photos and live music. There was even someone openly adding to the wall at the time of my visit. Not too crowded most of the time. Always best to go early morning if you want it to yourself. Defiantly worth checking out however. After pushing through the Prague Castle crowds and busy groups along Charles Bridge, this spot will feel like a different world entirely. There are still many tourists, but the road is quiet and tree-lined. A man plays accoustic covers of Beatles songs. He doesn't play well, and it's predictable. But it's not obnoxious, and the scene would be missing its touristy atmosphere without him. It would be just another grafitti covered wall. Americans can be recognized by their magnetic pull to the politically themed messages on the wall—targeting the current leader. Up and down the wall, strangers engage in conversation. In and of itself, the wall is not remarkable. The atmosphere it carries is unlike anywhere else in Prague, though, and this must be what draws us to it, again and again. Quiet disappointing this place. I excepted a strong connection to John Lennon, the Beatles or at least some art. For me it was neither of that. It is a colorful wall with uncountable tags of different sprayers over each other. On the very top you see at some point a little bit of John Lennon sprayed with a jig or alike, that’s it. Maybe some of the Czech texts have a deeper meaning and I just didn’t understand it. With my knowledge of languages and art it was not worth the visit. I like the wall but there are people who are making the most of it in terms of business. Like singers who pretend that the Beatles are their life etc. I think it's worth going to see the wall. It's a part of the Czech culture for a reason, but don't contribute to people who see business behind everything, please. Every day, we help thousands of travelers plan great vacations. Here are some tips on how to use your Listing Page to attract more travelers to your business - John Lennon Wall. Promote your permanent link - https://www.inspirock.com/czech-republic/prague/john-lennon-wall-a923262689 - on your website, your blog, and social media. When a traveler builds a plan from this page, the itinerary automatically includes John Lennon Wall. This is a great way for travelers looking for a great vacation in your city or country to also experience John Lennon Wall. Promoting your link also lets your audience know that you are featured on a rapidly growing travel site. In addition, the more this page is used, the more we will promote John Lennon Wall to other Inspirock users. For best results, use the customized Trip Planning Widget for John Lennon Wall on your website. It has all the advantages mentioned above, plus users to your site can conveniently access it directly on your site. Visitors to your site will appreciate you offering them help with planning their vacation. Setting this up takes just a few minutes - Click here for instructions.